Pittsburgh Salad does not enjoy the glamour of New York Cheesecake, Boston Cream Pie, Chicago Style Pizza, or Seattle Coffee. If you haven't lived in da 'Burgh, you probably never even heard of this French-fry-topped salad, and don't realize what you've been missing. Well, it's about time we put Pittsburgh on the culinary map. I know what you are thinking, "She plans to do that with fries on a salad? Pah - lease!" All I can say is, don't knock it till you try it. A fork loaded with crunchy romaine, well-seasoned waffle fries, and barely-melted cheddar can be remarkably good. My husband introduced me to this culinary wonder on our first date at the Union Bar and Grill on Craig Street, also known as the "Silicon Alley" of Pittsburgh. It was love at first bite. Why am I telling you about this salad? Bear with me. We got a rutabaga in our CSA this week with "It’s edible. Really!" explanation in the farm newsletter. Poor rutabagas. How did they get such a bad rep? They are sweet and yummy when roasted, particularly when cut into French fry shapes. This maximizes the surface area that touches the roasting pan and helps rutabagas brown. Although they don't turn crispy like potatoes, rutabagas caramelize beautifully and get those addictively sweet edges. 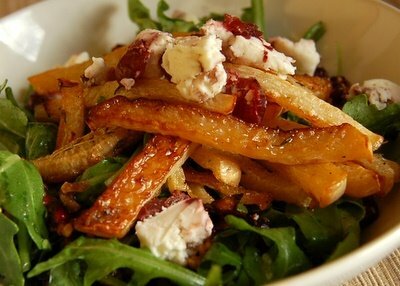 I piled the rutabaga fries on arugula with a little cranberry goat cheese, and pomegranate-almond topping. "Guess what we are having for lunch?" I called out to Jason from the kitchen. He took one look at the plates and said "Pittsburgh salad!" Ok, so maybe this salad is more like Pittsburgh meets California. The fries are not really fries, and it's suspiciously healthy. If you are a Pittsburgh native, please accept my apologies for yuppifying your culinary specialty and defeating the purpose of a properly bad-for-you salad. I just thought that a little change and a few yuppies can do our dear 'Burgh some good. Make 1 batch of Rutabaga Fries. Toss mixed greens, arugula, or baby spinach with your favorite vinaigrette (see this salad post if you want a basic recipe for a vinaigrette). Put the salad on plates and sprinkle with some chopped nuts and/or pomegranates for crunch. Then top with rutabaga fries and, if you wish, some cheese. Once upon a time, before the blogs roamed this planet, I used to write about food on my little foodadventures.org site. There were no templates, and photography was scarce and scary, but the recipes were good, and once in a while I’d get comments the old fashioned way known as e-mail. The most popular recipes in those good old days were Jason’s 4 Minute Tuna and Roasted Delicata Squash Salad. I just made it again last night with the squash and lettuce from our CSA. For a while I was wondering if this salad could ever be made in New England with all local ingredients. It seemed that the lettuces were only available in the summer, the squash in the fall, and never the two would meet. But yesterday, we got both. It was a sturdier lettuce, not as fragile as mixed baby greens I usually used, and it matched the texture of delicata even better. Place a rack into the bottom third of the oven. Preheat the oven to 375F. Cut the squash in half lengthwise, and scoop out the seeds with a spoon. Do not peel. Cut the squash into 3/4" cubes. Place the cubes in large baking sheet that can hold the squash in one layer and toss with olive oil, salt, and pepper. Spread evenly on a baking sheet. Roast squash for 20 minutes. Stir the squash, and roast another 10-15 minutes or until very tender and starting to brown. Cool until warm (about 15 minutes). While squash cools, make the salad. In a small bowl mix lemon juice, balsamic vinegar, and Dijon mustard with a fork until well blended. Pour the olive oil in a slow steady stream whisking constantly. Whisk until well combined. Season with salt and pepper. Tips on dressing: This is a basic vinaigrette dressing. It is made by combining 1 part acid with 3 parts oil. I find the combination of lemon juice and balsamic vinegar to be particularly good, but you can use any white wine vinegar or lemon juice for the acid. The mustard helps the dressing emulsify (keeps oil and acid from separating). If you don't have Dijon mustard, just skip it (do NOT use yellow mustard). Put the greens into a big bowl and toss with the dressing and salt to taste. Only use as much dressing as you need to coat the greens lightly (otherwise the acid in the dressing will wilt them). 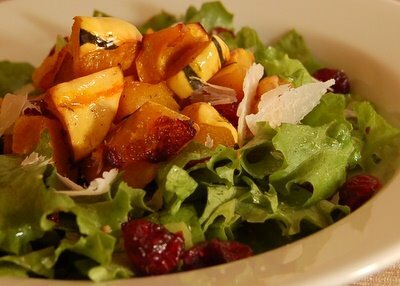 Arrange salad on plates, top with roasted squash. Sprinkle with dried cranberries, pine nuts, and parmesan. When you like to cook, people automatically assume that cookies, cakes, preserves, and pickles are things you should do well. I must admit that mastering these skills does come with a number of perks. You can make many friends in the office if you make good cookies, and ability to preserve foods is a sure sign of home cook’s practicality and resourcefulness. Unfortunately, I posses neither talent. Cookies and cakes require measurement, and pickling takes meticulous cleanliness (sterilizing the jars, etc). The worst thing is that both require tremendous amount of patience. You can’t just stick your finger into it every few minutes and see how it’s doing. Imagine my surprise, that in spite of my lack of precision, sterile cleanliness, or patience, I was able to produce amazingly good sauerkraut. It was so good that even my Grandma would be proud of me -- and she is a Russian sauerkraut maker extraordinaire. The Russian sauerkraut is a completely different story from anything you could possibly buy in an American store. 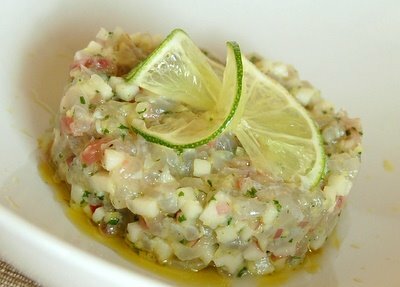 * It is crunchy with a slightly prickly tang reminiscent of horseradish (though that’s not one of the ingredients). It’s way less sour than store bought stuff and more crisp. I remember the huge bucket that took residence on my Grandma’s balcony in Moscow come autumn. I wasn’t particularly patient even then and was always bugging her – “When, oh when do we get to try the sauerkraut?” – until the big day would arrive. Finally, she’d remove the brick weighing down the cabbage, remove a few whole cabbage leaves coving the top of the bucket, and there it was – the most addictive cabbage known to man, dotted with ruby red cranberries. Eating this stuff straight from the bucket is like licking peanut butter with your finger out of a jar. Who cares if it’s not how it was meant to be eaten; it’s just so darn good! 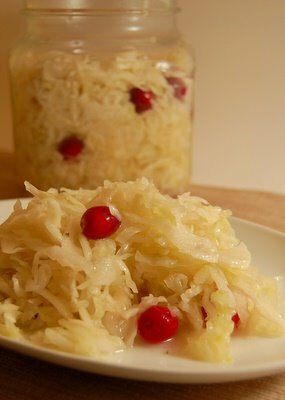 Sauerkraut is one of those wonderful foods that can be as at home on a weekday supper table as on a holiday one. Once dressed with chopped scallions, fresh herbs (we like parsley, cilantro, and dill), and sunflower seed oil (the olive oil of Russian cooking), it is a dish of really beauty. As much as I love sauerkraut, the idea of making it would have never crossed my mind if it wasn’t for our CSA. Did I tell you how much I love my CSA yet? I needed to find a use for a huge cabbage we got in our last share. Braising is always my favorite bay to cook it, but a large head of cabbage takes about a stick of butter and I was not in a stick of butter mood. Then I saw a pile of cranberries in my local produce market, and they immediately reminded me of my Grandma’s sauerkraut. 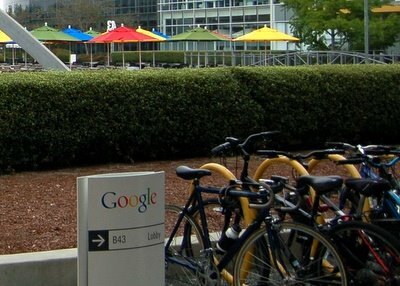 I googled for recipes and found one by Joanie Grow on Sauerkraut Recipes Site. Joanie Grow didn’t sound particularly Russian (hey, neither does Helen Rennie), but her recipe seemed like the real deal with cranberries and all. I followed it the best I could. The only changes I made were skipping carrots and apples because I didn’t have any, and proclaiming my cabbage done after only 5 days instead of 10-12. Well, she did say to taste it, and it tasted pretty excellent to me after 5 days (or maybe that’s my impatient side talking). This sauerkraut is kind of like half sour pickles. It doesn’t have the overly pickled taste or texture, and that’s exactly why I love it. You might wonder why I didn’t ask my Grandma for a recipe. Experience taught me that asking the women in my family for recipes doesn’t work. If I watch them, I can remember what they did, and then successfully recreate the process at home. But if I just ask them, I’d get a recipe like this: “Take a lots of cabbage, sprinkle with some salt, put in a bucket, and wait for it to ferment.” The recipes on many Russian recipe websites were not much more detailed, so I am really grateful to Joanie. Her recipe was the next best thing after watching my Grandma. * There are some exception. Real Pickles in Western Massachusetts makes outstanding Russian style sauerkraut and pickles and they are available in Whole Foods and gourmet stores around Boston. They don’t market their products as “Russian style,” but I am sure any certified Russian would give them a stamp of approval. A recent post from Gluten-Free Girl made me realize that I need to stop worrying. What can I say – I am an obsessive person. If you are a food blogger, chances are you are a little obsessive too. Would normal people take pictures of everything they eat and think about stories surrounding their food while driving to work, all to find something so beautiful, so delicious, so funny, and so dramatic that it simply has to go up on the internet immediately? Lately, I’ve had more stories in my head than I know what to do with and less time than I need to lead a reasonable life. I’ve been so torn between all the possible projects and stories that I haven’t been posting much. I guess I am not a journal keeper by nature. Recording what I do on regular basis is very difficult for me and I always try to find something out of the ordinary to write about. But maybe, with all this search for something really interesting to write, I’ve been ignoring the beauty and simple pleasures of everyday meals. This recipe was born one weekday night when I needed a 10 minute dinner. It was surprisingly good. Preheat the broiler and wrap a broiler pan with aluminum foil. Rub the salmon with salt, pepper, and olive oil on both sides. Place in the broiling pan skin side down. If using apricot preserve try to avoid the chunks as they will burn under the broiler. Spread your preserve, honey, or maple syrup on the flesh side of salmon that’s facing up (I used the preserve, but I am sure the other sticky sweet things will work too). 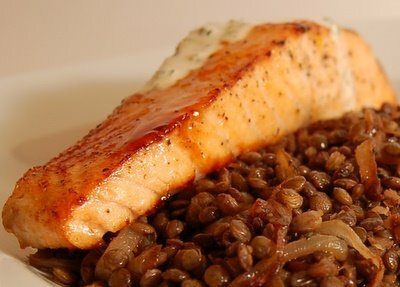 Cook salmon for 6 minutes per inch of thickness for medium doneness (8 minutes for well-done). Start it under the broiler (4 inches away from the flame) and check it every couple of minutes. As soon as the top browns, turn down the oven to 400F, and move the salmon to the middle of the oven to finish cooking. To test for doneness, separate the flakes in the thickest part of the fish with a fork and peek inside. Salmon is cooked to medium when you can separate the flakes at the surface, but get a good bit of resistance in the center of the fillet; the flesh will look very translucent. After salmon rests for 5 minutes it will flake, but still be a little translucent in the center. If you prefer your salmon well done, cook it until only a trace of translucency remains in the center. After 5 minute rest, it will be completely opaque. While salmon is cooking and resting, make the sauce. Combine all ingredients in a small bowl and mix well. Thin out the sauce with 1-2 Tbsp of water until it’s barely thicker than heavy cream. Season to taste with salt and pepper. Place salmon on serving plates (if the salmon skin sticks to aluminum foil, just leave it there), pour the sauce on top and serve. The opportunity presented itself yesterday in the form of delicata squash from our CSA. Delicata are from the winter squash family and have orange flesh and yellow skin with green stripes. They are the easiest winter squash to work with (easy to cut, and don’t require peeling), and are some of the sweetest and most flavorful. I roasted them first to get as much flavor out of these little pumpkin cousins as possible, then stuffed them with a mix of ground meats, cranberries, and some other stuff. All I can say is “Yum!” We opened a nice bottle of Barbera d’Alba and something about this meal made me feel like fall in Piedmont. Maybe it was the wine. Maybe it was ground veal (something I don’t often cook). But it had that warmth and simple pleasure of good home cooking. Note: You can use any ground meat for this dish. The more types you mix together, the more complex the flavor will be. Avoid lean meats. They’ll make your stuffing too dry. Preheat the oven to 475F and set the racks in the lower third and middle positions. Cut squash into 1 inch rings and scoop out the seeds. Spread squash on a baking sheet, drizzle with 2 Tbsp olive oil and sprinkle with salt and pepper. Rub the squash to coat it all over with oil and seasoning. Place the squash rings wide side down (if they have a wide side -- some rings will come out perfectly even). Roast in the lower third of the oven until the bottom of squash rings browns, about 15 minutes. While squash is roasting, mix all ingredients for the stuffing together. Cook a tiny piece of stuffing in the oven, skillet, or microwave and taste for salt. The stuffing should have the salt level of sausage, so don’t be too delicate with your seasoning. Add more salt as needed. 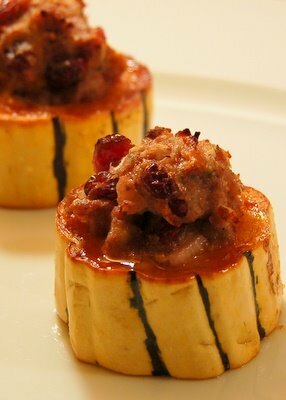 Stuffing can be prepared a day in advance and stored covered in the fridge. Flip the squash and stuff with the meat mixture. The stuffing should stick out of the squash. Turn down the oven to 400F. Bake squash in the middle of the oven until the top of stuffing browns slightly, about 20 minutes. Serve immediately, or cool completely, cover, and refrigerate. Reheat in 375F oven for 20 minutes.